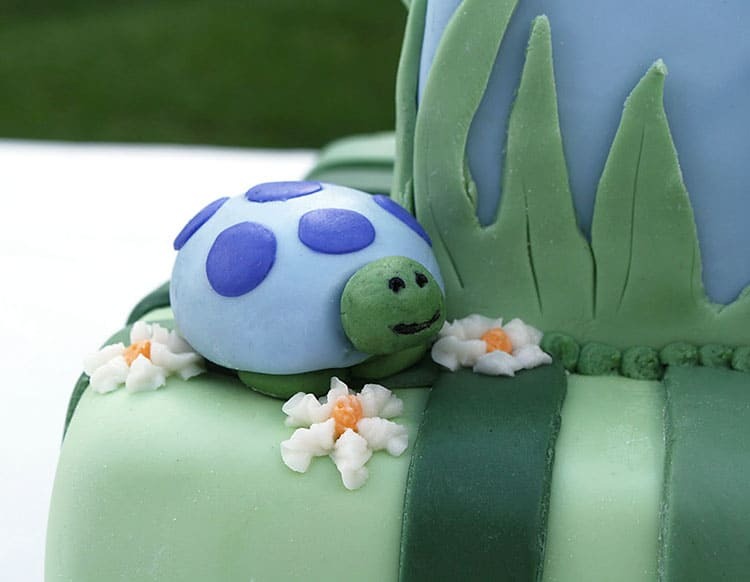 This Frog & Turtle Baby Shower Cake design was inspired by the invitation for the Baby Shower. It was a vanilla cake with vanilla buttercream, covered and decorated with homemade marshmallow fondant. So I have a thing: I hate frogs. As in… I hate them more than just about any other creature on earth. Spider? No worries. Snakes? No biggie. Roaches… okay – I also hate roaches. But frogs are the worst. I even wrote an entire post about it awhile back here. But back in 2011 when I was asked to do this cake, I was just starting/growing my cake business and I pretty much took every order that I was asked about. 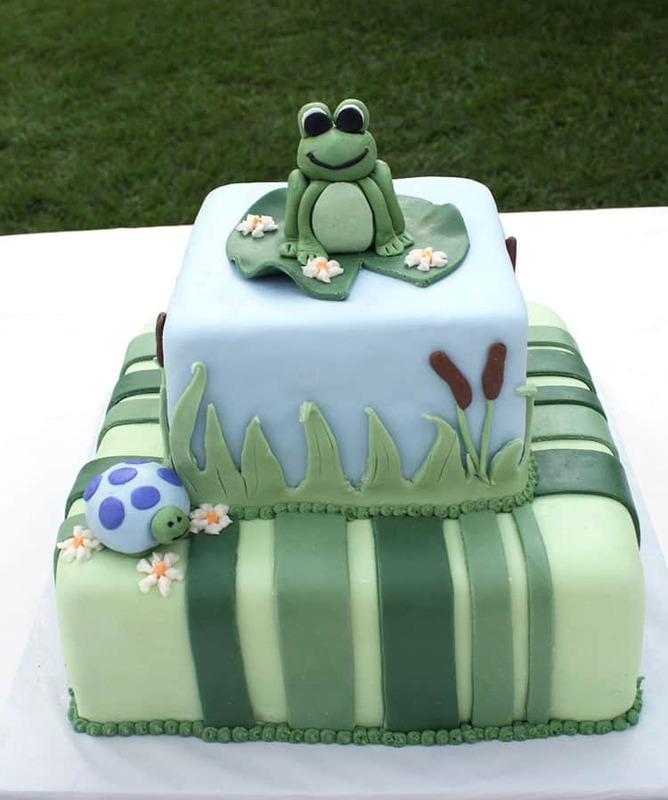 Including this Frog & Turtle Baby Shower Cake. And looking back, I was pretty busy that weekend. I also made a Hannah Montana cake and a Peace Sign Rainbow cake. Now if you click through those links – just be aware. I haven’t had time to update them all and the pics are sort of wonky. On the Wednesday before that weekend, I received a call from a sweet lady who was desperate for a cake. Due to the flooding in Natchez, MS (about 40 minutes from my home), the cake order she had placed had been canceled and she couldn’t find anyone available to do the cake because nearly everybody in the area was worried about the flooding and evacuations. She asked if I could do a cake, sort of “last minute” and I agreed. She emailed me this invitation to work from and I took off! 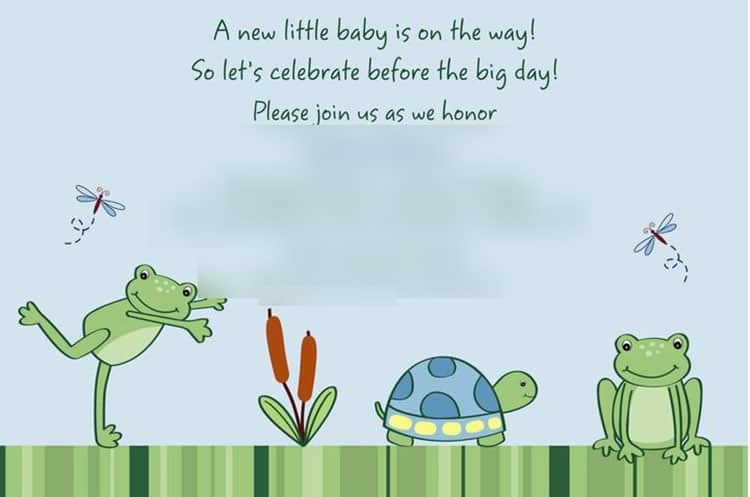 Even with my terror of frogs, the invitation was really cute and as I said before, I was taking almost every order I was asked to do. 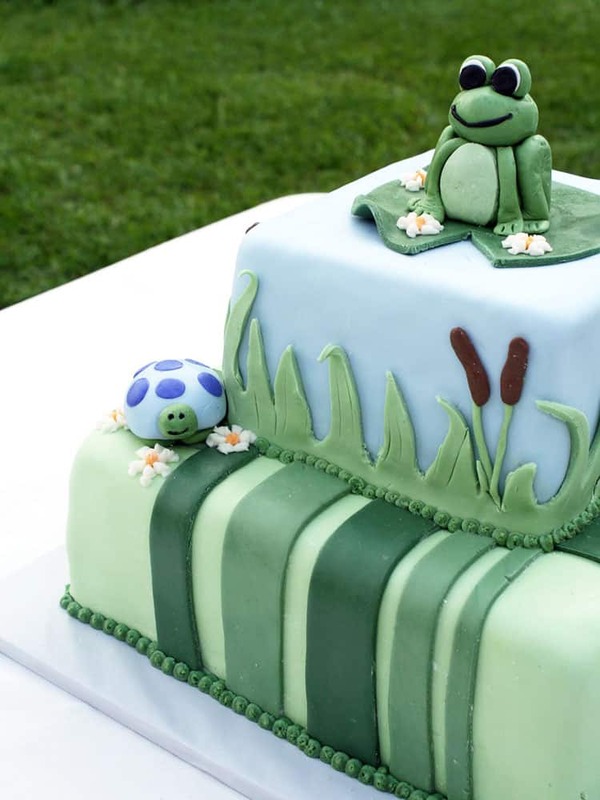 But I’m so glad I did – the cake turned out pretty adorable too! If you’re interested in learning to sculpt fondant (or gumpaste) animals, don’t ask me… haha! Instead, I recommend this Craftsy class. 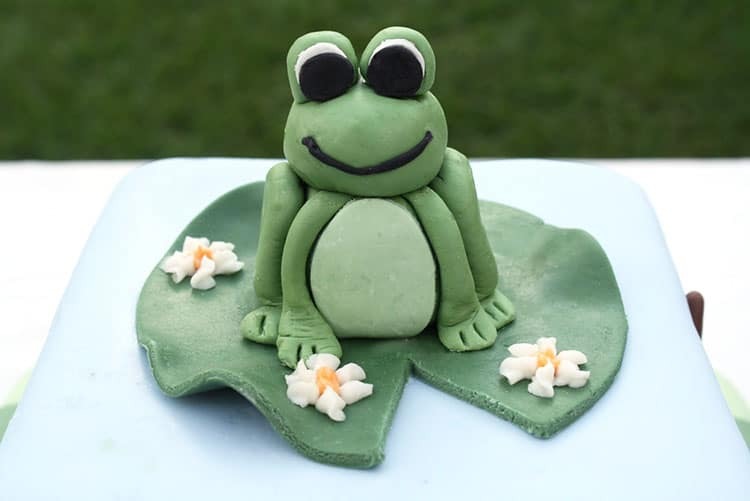 No one makes cuter fondant animals than Sharon Wee! My decorating skills were somewhat lacking back then but I still think the cake turned out great considering I’d only been doing cakes a few months at that time. Ribbon cutter for the stripes. Xacto blade for cutting the grass. Flower tip to pipe the little white flowers. And that’s all I’ve got for you I think. 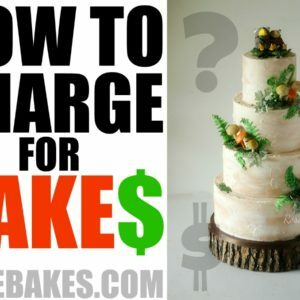 I’ve enjoyed sharing this “old” cake with you and updating with a few new details. If you have any questions (or comments), leave me a comment! What a beautiful cake! I love the cattails and that little turtle. Do you refrigerate your cakes that have any kind of cream cheese filling. Whether that be regular cream cheese, strawberry cream cheese or even the oreo cookies and cream? I have an order coming up that will be covered in fondant but the filling is strawberry cream cheese. Do I need to refrigerate it? I do recommend refrigerating cream cheese frostings. Lol, my terror is turtles. My family laughs at me and my soon to be 18 y/o son is nicknamed “Turtle”! 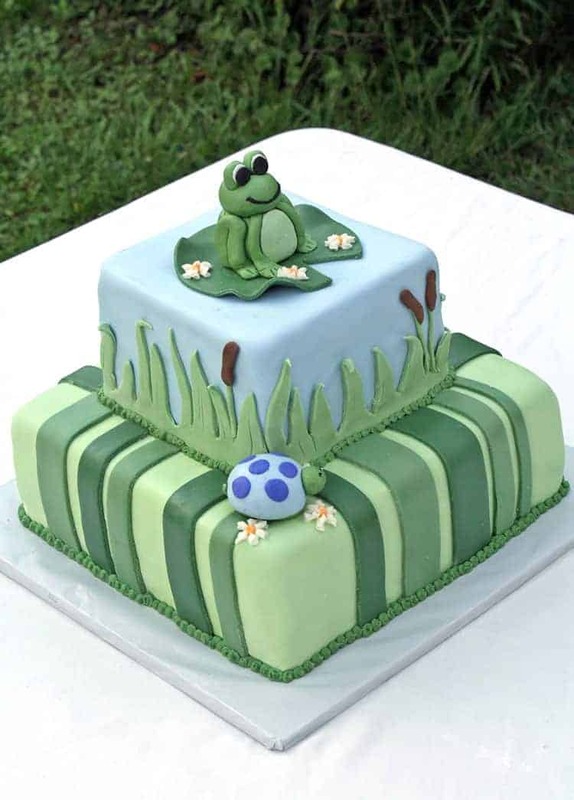 Anyhow, this is such a cute cake. And the froggie is too adorable! Hope you and your family have a wonderful 4th of July!! !